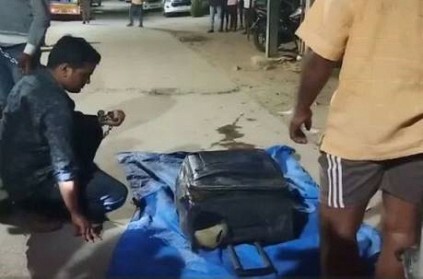 A case that took the city by shock, was when the body of a 25-year-old software engineer was found stuffed inside a suitcase, which was thrown inside a drain, in Medchal, a small town an hour away from Hyderabad. The suspect has been identified as Sunil, did not want to marry to the woman and decided to kill her. They both were working in Hyderabad and lived there with their families. According to NDTV, the woman was allegedly killed by her boyfriend, a mechanical engineer, who was her classmate in college. Police found the body on Sunday after some locals spotted an abandoned suitcase close to a school in Medchal. The family of the 25-year-old woman filed a complaint with police on March 7, three days after their daughter went missing. During investigation, the family claimed that the woman was in a relationship with Sunil and he wanted to move to Muscat for a job. The family also claimed to have last seen her on March 4 when they dropped her at Hyderabad airport so that she could fly to Muscat with her boyfriend so that the couple can attend a visa interview. The police further added that, Sunil then convinced the woman to go with him to a lodge. A day later, he killed the techie, stuffed her body in her suitcase and threw it in a drain in Medchal. Sunil, who hailed from Bihar, was working with an engineering firm. He had moved to Hyderabad years ago. Currently, he has been arrested and the body has been sent for postmortem. குழந்தை திருமணத்தை தைரியமாக தடுத்து நிறுத்திய குழந்தை! முழு விவரம்! This page contains news relating to various facts and events. The views are generally about current affiars and general topics in diversified areas such as political, international, national, and regional issues, sports, health, travel, lifestyle, technology and business. People having similar interets on the above topics will find this page useful. Hyderabad techie kills girlfriend, stuffs body in suitcase and dumped | India News.